We at Metropolis recently had the amazing experience of hearing John Robinson as a guest speaker at our company. Featured in the public television documentary Get Off Your Knees: The John Robinson Story, John shared with us the story of his life experiences, starting with his childhood as a very young boy. We learned what it was like for him, growing up and living his life, and he inspired us all. You see, John was born as a congenital amputee. His arms stop at his elbows, and he has no hands. His lower legs attach directly to his hips; he has no knees. Despite his physical limitations, John has never taken “no” for an answer, nor has he ever felt defeated. He found ways to deal with society. He excelled in his studies and maneuvered through many of the things we consider to be “basic,” like answering a telephone and driving a car. As you listen to his story and understand his experience, it certainly gives you a different outlook. His accomplishments are overwhelming. John has participated in sports. He attended Syracuse University and graduated at the top of his class in television and radio broadcasting. It took several years for him to find his first job—after submitting hundreds of resumes—but he never gave up. In fact, John became a leading salesperson for his employer. 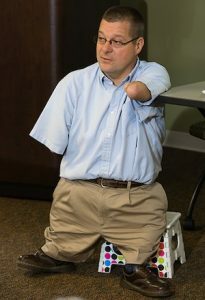 John ultimately found that his purpose in life was to help others with disabilities. This realization inspired him to found Our Ability, which builds employment opportunities for individuals with disabilities. His organization helps businesses leverage the successful employment of people with disabilities and provides training on disability culture, employment and the Workforce Innovation and Opportunity Act. In addition, Our Ability helps individuals with disabilities enhance their professional profiles and connect with employers. The men and women who work at Our Ability are among the most reliable that you could encounter. I ask you to take a look at his website, and should you have any positions that may fit the need, please contact John.